Moscow’s ex-mayor has revealed his administration’s contacts with current U.S. President Donald Trump over a sprawling underground mall near the State Duma in the late 1990s. A U.S. special counsel is investigating Russian interference in the 2016 presidential election and possible links between the Trump campaign and the Kremlin. Both Trump and Moscow deny any wrongdoing. “Trump was in Moscow. He had contacts… on matters related to the construction of the Okhotny Ryad underground mall on Manezh Square,” ex-Mayor Yury Luzhkov told Interfax in comments published Tuesday. Trump, Luzhkov told the news agency, had “one or two” contacts with then-first deputy mayor, current Duma lawmaker, Vladimir Resin who oversaw Moscow’s construction industry during Luzhkov’s reign. 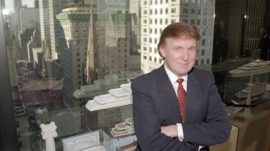 Resin’s talks with Trump alongside other U.S. real estate moguls were reportedly broadcast by Russian state television in 1995. Trump also traveled to Moscow in November 1996, where he announced plans to invest some $250 million in several building projects, including a high-rise tower just north of Okhotny Ryad. Okhotny Ryad, estimated to be worth between 55 billion and 75 billion rubles ($840 million and $1.1 billion) in 2018, was built in 1997. Resin replaced Luzhkov as acting mayor until Sergei Sobyanin’s appointment in 2010. Luzhkov, who served as mayor in 1992-2010, was reportedly fired for poorly managing Moscow and fostering “exorbitant corruption” during his reign.